[Updated 03:35 GMT, March 2] Russian Space Forces successfully launched three GLONASS satellites from the Baikonur launch site in Kazakhstan on March 2, at 00:19 Moscow time (22:19 GMT, March 1). The launch had been postponed from last September after an anomaly was discovered in one of the on-orbit space vehicles (SVs) navigation payload. On February 26, Russian launch controllers rolled out the Proton-M/DM-2 rocket with the cluster of three Glonass-M satellites onto launch pad 81. Prelaunch autonomous tests of the launch vehicle’s control system with ground stations and the upper stage in the loop are taking place, along with tanking simulations. 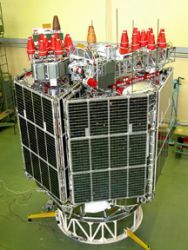 Russian currently has 20 operational GLONASS satellites on orbit, although two of them are currently out of service for maintenance, including GLONASS 726 that has the signal generator problem.The new launch will bring that number to 23. Last month, Yury Urlichich, director-general of the Russian Space Device Engineering company (RISDE) and GLONASS general designer, said that a total of three triple-SV launches will take place this year.